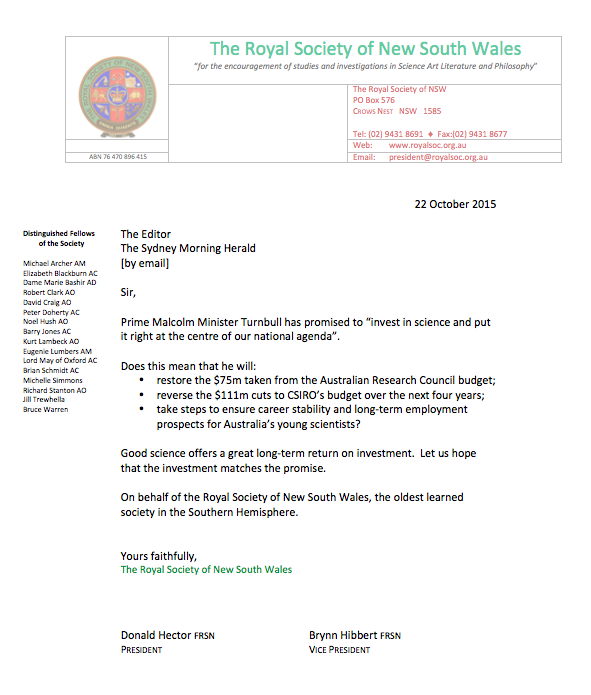 Nov 4, 2015 Here is the text of an open letter (submitted to Sydney Morning Herald but unpublished) to Australian Prime Minister Malcolm Turnbull, drafted by me on behalf of the Royal Society of New South Wales. In a recent speech, Turnbull promised to “invest in science and put it right at the centre of our national agenda”. We ask just what this means in practical terms. Will he reverse the recent savage cuts? We’ll see. Take steps to ensure career stability and long-term employment prospects for Australia’s young scientists? Good science offers a great long-term return on investment. Let us hope that the investment matches the promise.